Our multilingual transcription service uses expert transcribers to quickly and accurately complete your project. the true essence of your audio, or edited transcripts to tidy up the spoken word in written form. Our talented, committed linguists have broad sector experience and an ear for nuance to give you the guaranteed peace of mind that comes from knowing your project will be completed to optimum quality, on time, and within budget. It is not only speed and accuracy that our expert transcribers bring to the table; the unrivalled patience and persistence with which they handle even the most challenging of projects yields consistently brilliant transcription results, even with multiple speakers and low-quality audio. The Translation People are quality-obsessed, and our multilingual transcription services are no different. Each and every one of our transcribers has excellent linguistic skill and a real passion for clarity and quality. When combined with rigorous terminology research and a keen eye for detail, the result is a transcription which reliably reflects the audio. 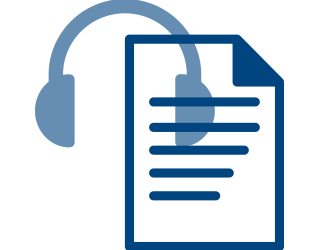 Your Account Manager will be on hand throughout your project with the specialist knowledge to give you trusted advice on the varieties of transcription we can supply, which includes time-coded scripts. Whether verbatim, edited, or intelligent, their ultimate goal is your transcription’s success. Our experience, tenacity, and adaptability mean we are capable of handling any request. Whether you are in the legal or medical sector, whether your project is large, small, one-off or ongoing, whether a live broadcast or a recording, whether it is English, Arabic or Estonian, time-coded or not, we promise to deliver precise, cost-effective multilingual transcription services. Quality multilingual transcription services allow you to quickly obtain accurate documented versions of audiovisual content for a wide variety of purposes.